Off road: Riding at lower pressure means better performance ... but at the same time it increases the risk of failures. The limit so far is at about 20 psi, below which it's hardly possible to dare to ride normal MTB tyres. But nothing stays the same: In the future, air pressure can be controlled in the tyre's double chambers. In the outer chamber, the air pressure is extremely low - ideal for maximum off road performance. In the inner chamber, directly on the rim, there is high air pressure - even a very strong impact cannot dent the rim edge. At the same time, the inner high-pressure system secures the tyre onto the rim. "Burping"?, the dreaded loss of air at low pressure in conventional tubeless systems, is impossible. 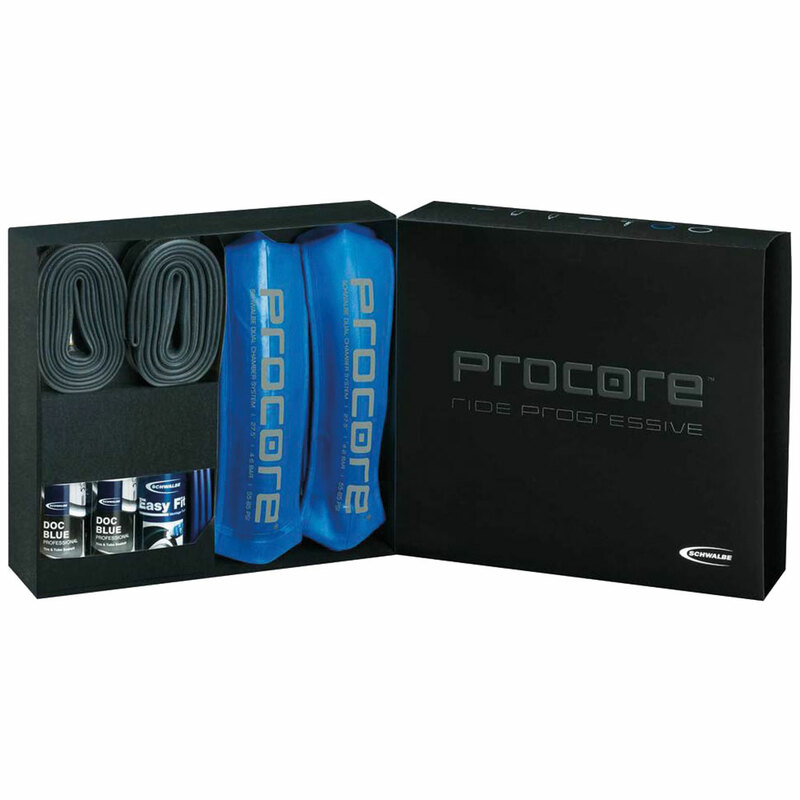 The Name: PROCORE is derived from "Progressive Core". The core (internal high pressure chamber) progressively absorbs even the hardest impacts. The Compatibility: You can mount Procore with any tubeless compatible MTB tyre. The system is available for all three MTB wheel sizes (26", 27.5", 29"). Weight approx. 200 g per wheel. Compatible with all wheels, independent of the brand. Minimum inner rim width: 23 mm. Tyre pressure can be reduced to a minimum 14 psi, thus providing a huge amount of grip. Even on the roughest terrain tyres "stick"? to the ground. Even in the toughest conditions, significantly lighter tyres can be used.